Dr. J, Julius Erving is maybe the most spectacular basketballer ever, and one of the best dunkers. He was named to the NBA's 50th Anniversary All-Time team and in 1993 was inducted into the Basketball Hall of Fame. As his career blossomed early, Erving helped legitimize the American Basketball Association (ABA). Much as some players are considered "the team," Dr. J was considered "the league." He was the main asset of the ABA when it merged with the NBA after the 1976 season. 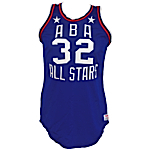 The ABA's final All-Star game that year is generally acknowledged to have been one of the greatest sporting events of its kind. The game was played in Denver and pitted the Denver Nuggets against the best players from around the league. It featured the first halftime slam-dunk contest. For his first dunk, Erving stood underneath the basket and dunked two balls at once. But his second was the one that will always be remembered. One of the contest rules said that a dunk had to be made from a hash mark three feet inside the free throw line. Erving decided to take it an extra step. Three extra steps, to be exact. When Erving jogged to the free-throw line and then began to measure his steps back in long, loping strides, the crowd went into a frenzy, as did the players sitting on the sidelines. "Here was my philosophy -- dare to be great," Erving said. With seven giant strides, one great leap, and one forceful slam, Erving shook the basketball world with his rim-rocking dunk for the ages. This was the very uniform worn by Dr. J that historic night in Denver. It is said to be the precursor of the merge. On the left front tail of the jersey is the "Wilson" manufacturers tag with wash instructions and jersey size "44." 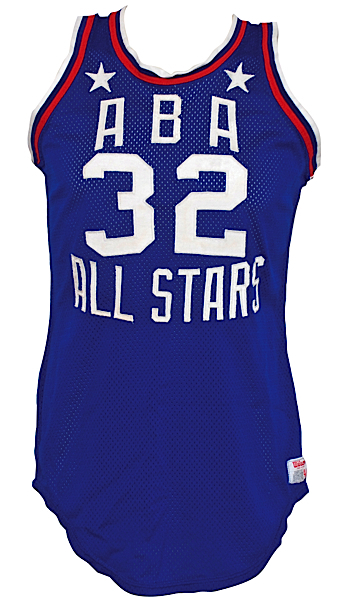 On the front is "ABA ALL STARS" and player number "32." On the back is the player number "32" along with "ERVING." All numbers and letters are done in white tackle twill. There is a white star on each front shoulder strap. The trim of the jersey is red, white and blue in celebration of the bicentennial. Below the rear inner waist band of the shorts is the "Wilson" manufacturers tag with wash instructions and shorts size "34." Attached is a flag tag with alterations written in blue ink that have faded. There are two embroidered white stars on the outer left seam. The provenance of this treasure is iron clad. It is accompanied by a LOA from a former Nets ball boy which states the following, in part, "...During training camp in 1975 at the Merchant Marine Academy, I asked Dr. J if I could have his All-Star Game Uniform. The first home game after the All-Star Game, Dr. J. dressed and he called me over. He handed me a bag with his 1976 All-Star Game uniform along with a program which contains several autographs. I have had this as a part of my collection ever since..." In addition to the LOA from the ball boy, it is accompanied by a 1976 All-Star Game program that Dr. J handed him with the uniform which has been signed by many All-Stars. All signatures are done in black marker and rate an overall 9. The program is accompanied by a LOA from JSA. Also accompanied by a 24" x 36" poster of Dr. J making his dunk at the 1976 All-Star game wearing this very uniform. It shows game-use and appears to have no alterations of any kind. This is the most important shirt in ABA history! Auction closed on Thursday, May 15, 2008.